A defence minister is reported to be prepared to resign if cuts are imposed on the army which would see it lose 12,000 soldiers. Tobias Ellwood, the minister responsible for defence personnel and veterans, is understood to have concerns about proposals which could see the army’s full-time strength reduced to 70,000. Mr Ellwood has shared his ‘deep discomfort’ with colleagues about a list of cost-saving options faced by the Ministry of Defence, the Times reported. A Whitehall source quoted by the newspaper said the Ministry of Defence was ‘beginning to try and push back’ against the cuts. The MoD said no decisions had been made and dismissed reports about the options being considered as ‘speculation’. But Defence Secretary Gavin Williamson was said to be shocked by the ‘completely awful’ headline proposals drawn up by military chiefs, according to a Times source. Other measures thought to be under consideration include reducing the order for Ajax armoured vehicles and delaying upgrades to other tanks. Mr Ellwood, who served in the Royal Green Jackets from 1991 to 1996 with tours in Northern Ireland, Cyprus, Kuwait, Germany, Gibraltar and Bosnia and is now in the army reserve, has indicated he would have to step down if the military was not shielded from the proposed reductions, the Times said. Speculation about defence cuts has mounted in recent months since the launch of a review led by Theresa May’s national security adviser Mark Sedwill. 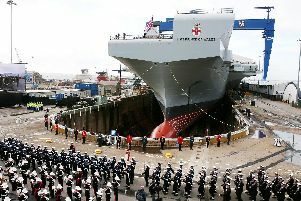 Other options reportedly under consideration include the axing of amphibious assault ships HMS Albion and HMS Bulwark, alongside the loss of 1,000 Royal Marines. An MoD spokesman said: ‘We have the biggest defence budget in Europe and are one of very few countries to not only meet but exceed NATO’s 2 per cent spending target. ‘In the face of intensifying threats, we are contributing to the cross-government review of national security capabilities and looking at how we best spend the rising defence budget to protect our country.